If you are looking for information on the El Pollo Loco franchise business opportunity, El Pollo Loco Fresh Mexican Chicken Grill franchises or El Pollo Loco Mexican grill franchising, then you have come to the right place. 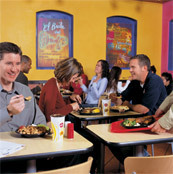 The secret to El Pollo Loco's success is our great tasting food. Our menu has a broad and deep consumer acceptance across a wide span of demographic and socioeconomic sectors and is a healthy alternative to traditional fast food. The first El Pollo Loco, or "The Crazy Chicken," began as a roadside chicken stand in the small town of Guasave on Mexico's Pacific Coast. It featured an authentic family recipe-fresh chicken marinated in special herbs, spices and citrus juices and then flame-grilled to perfection. The restaurant quickly became a local favorite. In 1980, the first California restaurant opened. Today, El Pollo Loco is owned by American Securities Capital Partners, a New York-based equity investment group and Company Management. The tradition continues with signature dishes that satisfy consumers desire for flavorful food that fits well with today's healthy lifestyles. We're currently flame-grilling marinated chicken in 322 El Pollo Loco restaurants: 137 are owned and operated by the company and 185 are owned by franchisees.